As I announced back in August, today 23rd October 2011, I’m running my 4th marathon, 10 years after having run the last one. When I wrote that post, I mentioned that I would be raising funds for a charity, “Vaincre la mucoviscidose”. With this post I wanted to thank those persons who contributed to the cause: Nacho, Jaime and Luca. Thank you for your contributions!! The people affected by the illness and I sincerely thank you for them. Together we have raised 240€ as you can see in the cheque below extended to the charity association. 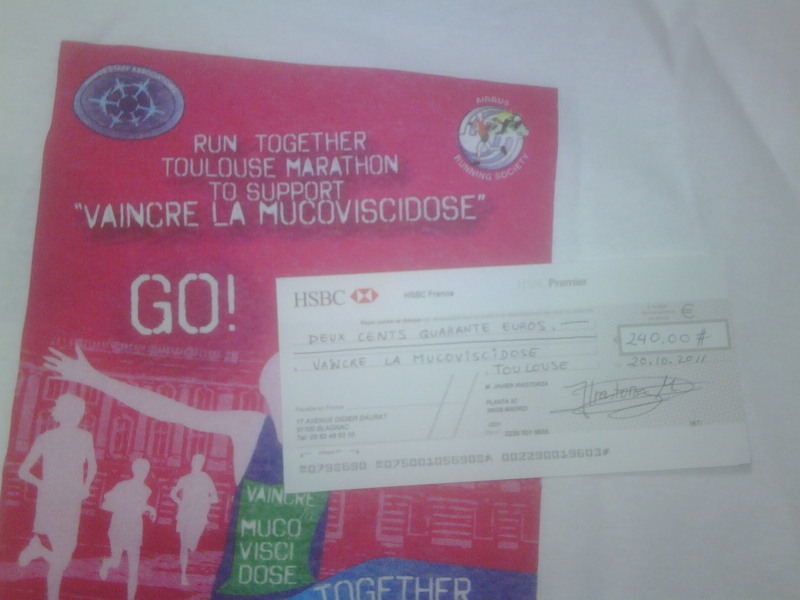 Check sent to the charity "Vaincre la mucoviscidose". Finally, in case you wake up early enough, you may follow the race live through this link. My bib number: 2329!